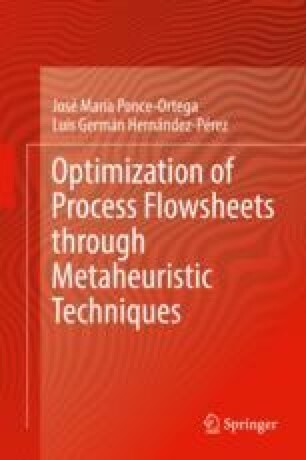 There are optimization processes of industrial interest that involve functions that present a large number of local solutions, and therefore it is very difficult to determine the optimal solution using deterministic optimization techniques. For example, consider the case shown in Fig. 3.1, in which the cost function for the design of a heat exchanger relative to pressure drops is represented in a diagram. In this case, we can see that there are two local solutions, so if we use a local search procedure, the algorithm could be trapped in the solution that does not present the minimum cost since it complies with the stopping criteria of these optimization algorithms.